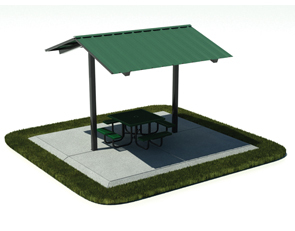 Easily provide a shaded area for your site amenities with these durable shade structures. This long lasting steel shade structure is a great way to protect your outdoor furniture from damaging weather. Two-post design is perfect for shading picnic tables or benches. 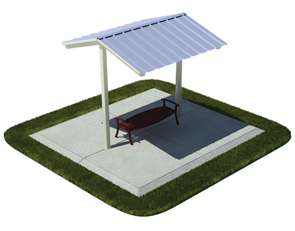 This all-steel shade structure is avalable as a sub-surface mount for a permanent installations. Steel frame is coated with a superior corrosion-resistant paint finishing system. 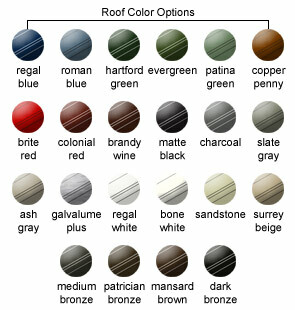 Strong steel roof comes in two sizes and is available in the colors shown below. Customize color of frame and roof to match any outdoor setting. 5" x 5" Square Posts. Copyright and Disclaimer © 1993-2019, Belson Outdoors, Inc.